In celebration of 2017 Science Week, we would like to announce the launch of #SheSpeaks STEM. We are passionate about engaging more girls and women in Science, Technology, Engineering and Mathematics (STEM). One way to inspire girls and women is by making women in STEM more visible and by highlighting the stories of the amazing work that women are doing with STEM across Australia. We believe that Australia is world-leading in STEM and that we have a number of inspiring male and female STEM scientists and educators, however, not all conferences and events have equal representation of women as invited Keynote speakers and as panel experts. Regardless of the reasons for this disparity, we do receive genuine requests from colleagues and friends across Australia inviting us to recommend women to speak at STEM events. 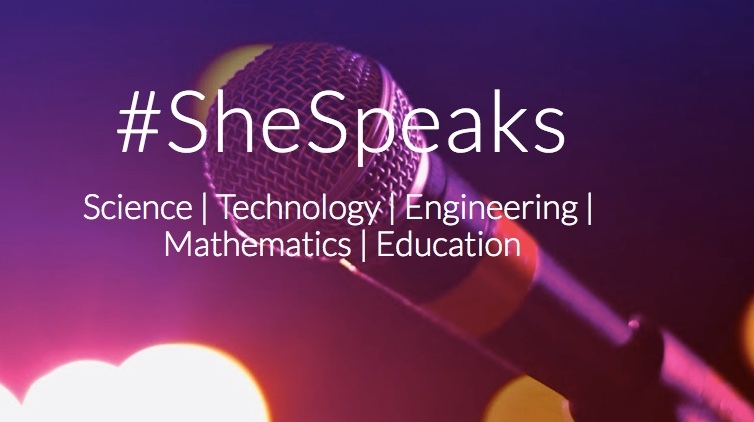 This brought us to the idea of creating a community platform to shine a light on inspiring female speakers in STEM disciplines and STEM education across Australia – #SheSpeaks STEM. This site is designed to curate and showcase recommendations for women who are experts on various STEM topics and STEM education. This website can be used by those organising STEM conferences and events who are seeking Keynote or Panel speakers – from small local events to larger national events. We need your help! We are currently seeking community input to build up our list of speakers and are calling on you to contribute. Please nominate a female speaker in Science, Technology, Engineering, Mathematics, or STEM education and help us build a community database of speakers that Australian events organisers can draw upon. Who inspires you? Who would you recommend? Nominate a speaker!